When you need an ergonomic keyboard that features unparalleled security features, the Goldtouch Smart Card Ergonomic Keyboard by KeyOvation is on the case. Using smart card technology that requires positive verification of user's identities, it's indispensable to those with security clearances like military and government personnel. 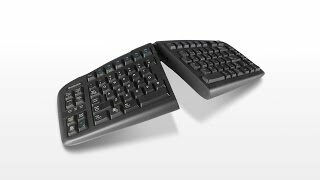 With built-in splitting and tenting features, users can keep hands in a comfortable typing position for all day use without strain. Considering this is the only small ergonomic smart card keyboard, it isn't bad. It's heavy, but not a problem once it's sitting on your desk. It may require you have keyboard drivers reinstalled to get the keyboard recognized by your machine. I've also found on occasion that the card reader sometimes doesn't work. To rectify this, I reconnect the USB plug (pull it out of the port and then reinsert it); there is no need to restart the machine. I love that the keys are soft-touch and quiet. The only thing keeping the rating from 5-star is that the keyboard could be a little smaller in width. $119.00 List Price: $149.00* The list price is the same as the MSRP (Manufacturer's Suggested Retail Price). It may not necessarily be the price at which the product is sold.